During the past few years, Japan fitness equipment market registered growth on account of expansion of gym and fitness centers/facilities spanning across the residential and commercial space. Rising health concerns among the elderly population in the country, development of residential and commercial compounds owing to growing tourism and upcoming events and government initiatives for healthier working environment and installation of outdoor fitness equipment would lead to higher Japan fitness equipment market forecast revenues over the coming years. According to 6Wresearch, Japan fitness equipment market size is projected to reach $333 million by 2024. Fitness equipment market in Japan is expected to record strong growth over the coming years. Government initiatives, proliferation of fitness devices, rising fitness centers, growing health awareness, and substantial increase of fitness spending are some of the key factors which would drive the growth of fitness equipment market in Japan. With the upcoming international events, Japan is anticipated to witness growth in hotel development attributed to tourist boom. Additionally, construction of residential complexes coupled with the government initiatives are expected to drive the Japan fitness equipment market. Gym centers would remain as the key growing segment for fitness equipment market vendors in Japan. Also, with several international sporting events taking place in Japan and increasing investment towards the same, number of gym centers are likely to surge over the next few years. This trend is expected to drive the demand for fitness equipment in the country. Further amongst the fitness equipment types, cardiovascular equipment segment accounted for majority of the Japan fitness equipment market share in 2017. 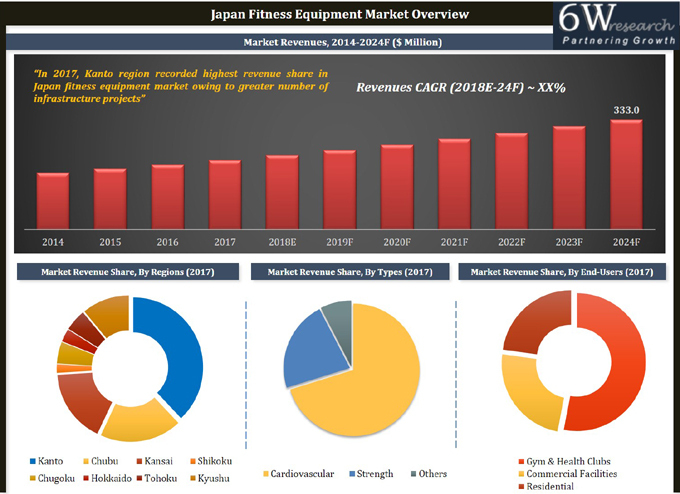 The Japan fitness equipment market report thoroughly covers the market by fitness equipment type, end-user applications, regions, and facilities. The Japan fitness equipment market outlook report provides an unbiased and detailed analysis of the Japan fitness equipment market trends, opportunities/high growth areas and market drivers which would help the stakeholders to device and align market strategies according to the current and future market dynamics. 14.1 Life Fitness Japan Ltd.
14.2 Dyaco International Dyaco Japan Ltd.
14.3 Konami Sports Life Co. Ltd.